Black nail polish (I used Saffron Black). Silver nail art pen ( I used Rio Silver). Fuchsia pink nail polish (I used Sally Hansen Fuchsia Power). Silver nail polish (I used Rimmel Pro Silver). Silver Glitter ( I used Lavat). White nail polish (I used La Femme). Step 1: Apply striping tape diagonally across nails. Step 2: Apply fuchsia to bottom half of nail and white to the top half of the nail. Step 3: Once dry, remove striping tape. Step 4: Using the silver nail art pen, carefully draw a line across the nail where the striping tape has left a gap. Step 5: Using a 'glob' of black polish, use the dotting tool to add polka dots to the white of the nails. Step 6: Apply top coat to the nails once they are dry and you're done! Simple nail art! I also used Silver polish and Glitter for an accent nail. 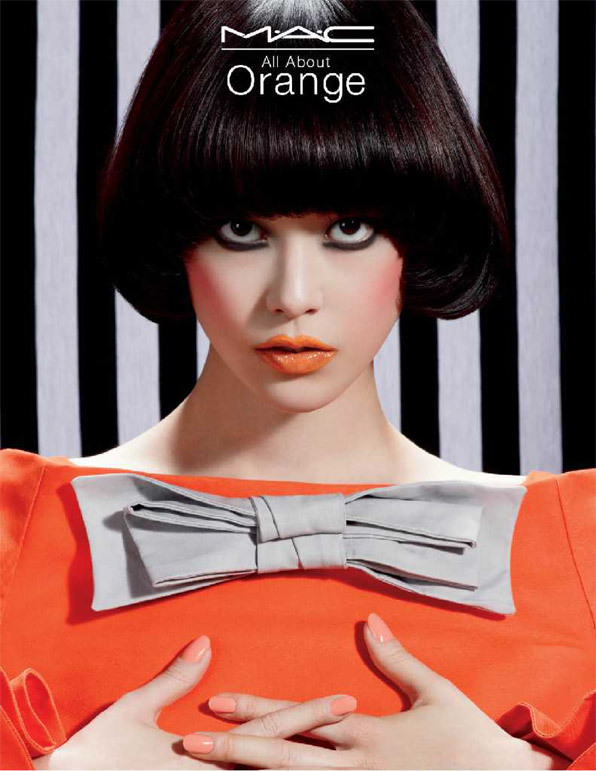 To celebrate one of this summer's hottest colours MAC are launching a new range of orange hues on June 6th. The eye-catching oranges range from pale peach to neon tangerine! 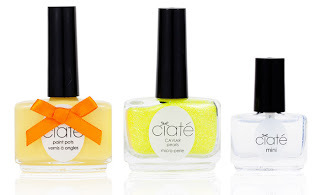 The nail polishes will be part of the All About Orange Collection extending to their cosmetics for face and lips too. 'KeAi' - Soft pink frost. 'Sweet Pop' - Peachy cream. MAC's formula offers long wearing finishes that are no-streaking and chip resistant. 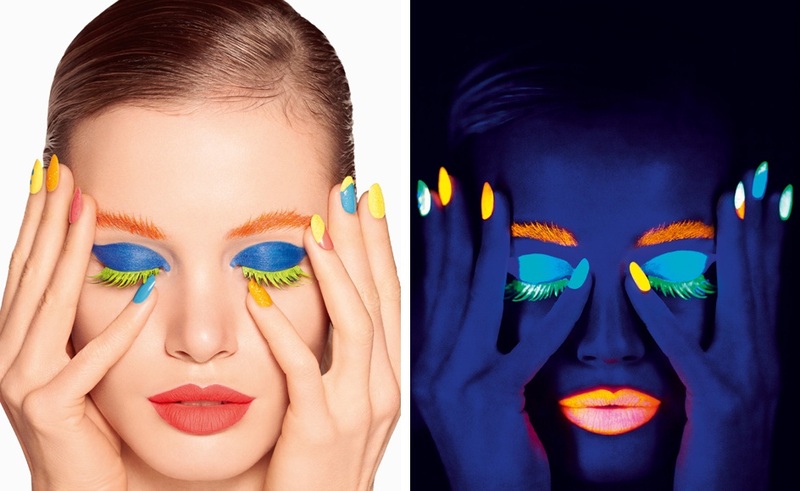 Contributing to the huge neon trend this summer, Ciate will be launching their Corrupted Neon Kit. 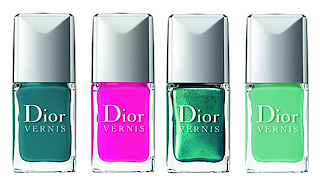 the kit will also include Neon Caviar pearls, which together with the popping neons it will be sure to make your nails stand out this summer! The collection will launch in June and will be available at http://www.selfridges.com/ for £25. I love the sound of this collection! It just shouts exotic, luxurious, classy, summer nails.To add even more excitement the collection is divided into 2 looks: 'Glowy Exotic', the daytime look and 'Wild Feather', the night time look. 'Samba' - Peacock Green & Sea Blue. 'Bahia' - Hibiscus Pink & Petroleum Blue. 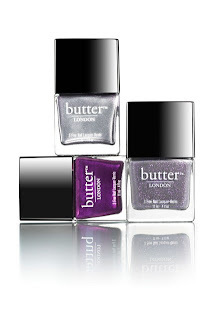 With a Royal baby on the way and in honour of the recent Queen Jubilee and Royal Wedding, Butter London have launched a Limited Edition Royal Collection just in time for celebrating Kate and William's new baby! 'Pitter Patter' - An opaque shimmer aubergine. 'No More Waity, Katie' - Sheer lilac..
'Lillibet's Jubilee' - opaque silver/lavender metallic foil. Hopefully they will be sending Kate the lacquer too! It also boasts to be chip-resistant for up to 10 days and the formula has Patented Micro-Encapsulated time-release Technology. The shade I applied is named 'Barely Blue Bell', a deep mint shade. I was actually pleasantly surprised by this polish! I know that it boasts to be a good manicure polish, but having tried so many top branded 'chip-free long lasting' polishes and having them all fail, I must admit I didn't have high hopes for poor Sally. The application was ultra-smooth and I only needed one coat!! It gave great full coverage and I was amazed at how quickly it dried! The finish gave me a strong, glossy manicure. Now the reason that I turned to this polish was because I was facing a very busy week and knew that I wouldn't have time to do my nails. I have a business to run, a house to clean and a very active 1 year old to see to, so the wear and tear on my nails is usually quite harsh (washing, cleaning ,baby, shopping etc). 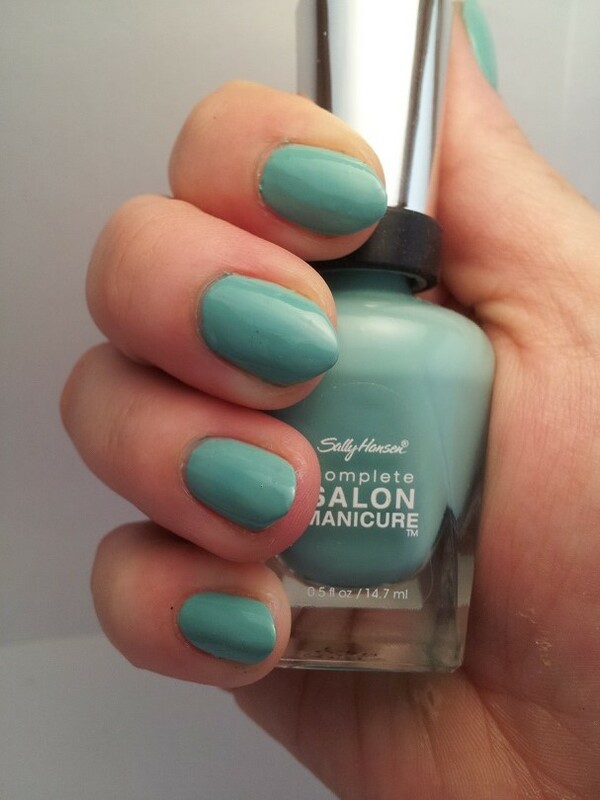 The Sally Hansen Manicure definitely passed the test!! Most of my manicures only last a day or two, but Sally came through for me! After 8 days of wear ( I had to take it off to do a nail tutorial) my nails were still going strong and looked shiney. I had a couple of barely noticeable chips ( from hedge trimming!) but that was it. The only disadvantage I found was that when I came to remove the polish one of my nails was slightly stained a green mint colour in the corner, which came off after more remover. 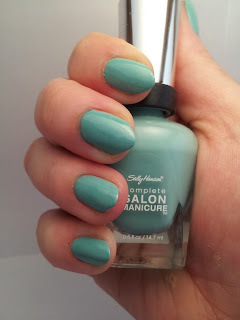 I would give Sally Hansen Complete Manicure 8/10 and will definitely be buying more! 2 pinks (polishes or acrylic paints) one light pink, one dark pink. Green (polish or acrylic paint). Fine dotting tool or fine tip brush. Palette or clean jar lid/bottle lid. Step 1: After your base coat has dried, paint your nails chosen colour ( I used China Glaze 're-fresh mint'). Step 2: Once your nails are dry, add some pale pink spots to your nails, they don't have to be perfectly round and usually works better if they aren't. Step 3: Using your palette or clean jar/bottle lid( I used a jar lid, as easily disposable afterwards! ), add a small blob of dark pink and green (I used Sally Hansen Fuchsia and NYC in Green). Step 4: Using the dotting tool or fine brush draw dark pink edges around your pale pink roses adding some curves in the centre too. Step 5: Add your green leaves using the dotting tool or brush (make sure clean first) by drawing small 'v's around the edges of the roses. Step 6:: Ta Da! 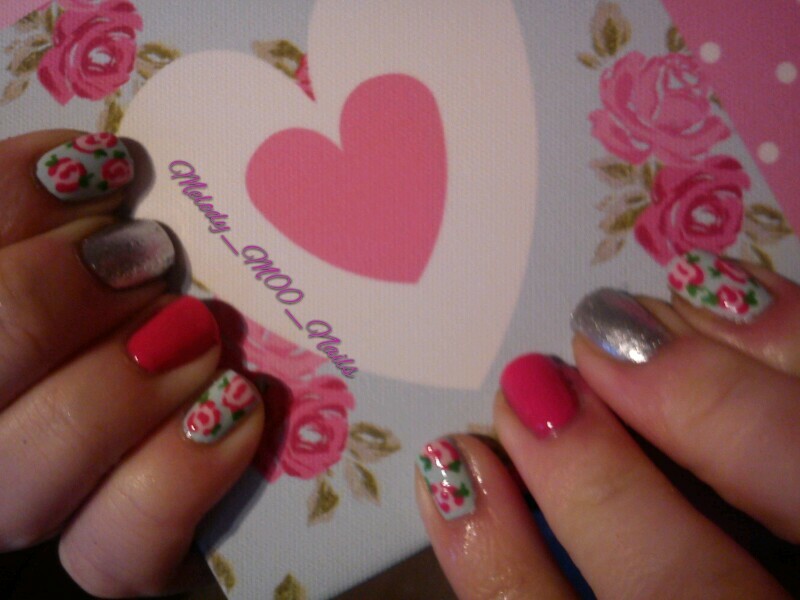 Apply a top coat when dry and there you have a basic floral design on your nails! I also used a fuchsia and silver accent nails. So I thought my first post on here should be an introduction......My business is Melody Moo Nails & Jewellery but my actual name really is Melody! I am 32 years young, married with a very active, very ARGHHHHHH one year old at the minute. I am studying a Psychology Degree, which is something I always wanted to do as have quite an analytical mind. I recently began my dream of having my own business and working from home. Melody Moo sells acrylic nail sets that I design and do myself, fashion jewellery with the latest affordable trends, Moo jewellery which is off course my signature Moo Cow jewellery and I also create and make my own jewellery designed and painted with nail polish effects. I spent my whole life wanting to work for myself but it has definitely took me a long time to get here...I guess sometimes life can get in the way! I have always loved fashion, jewellery and nails and have been creating my own nail designs for many many years and coupled with business and finance qualifications and experience, Melody Moo is perfect for me! I am hugely passionate about my work and I often stay up late to create my designs and put a lot of love into my business, so it's not just about £. Other hobbies??? I used to have something called 'spare time', but since my son has arrived I think that has sorrowfully gone out of the window! But once upon a time, and if I ever do get some free time, I would say my interests are predominately Gaming and Reading. Yes I'm a huge bookworm! I will read anything I can sink my teeth into, but my favourite books are my classics of 'Alice in Wonderland' and 'The Hobbit'. As for the Gaming, yes I am a 'Gamer Girl'! Ever since my Dad bought me my first Commodore 64 I have been addicted to the world of games consoles. I barely get time to play anymore, but Friday nights, once work is done with and my son is in bed I get the chance to play. Personality wise I can be confusing so I will try to keep it simple with some keywords...bossy, feisty, sarcastic, positive, outspoken, strong, humorous, daft, animal lover, intelligent. So there you have it...I hope you follow my blog as I journey myself through business, babies, rants, chaos and success!